While the new BMW M5 (F90) is inspired by racing with its numerous BMW M components such as an active M-differential, M-Steptronic eight-speed gearbox and M carbon ceramic brake system, the new KW Variant 4 offers a coilover suspension exclusively for super sports cars, sports cars and high-performance sedan. With the Variant 4, the BMW M5 reacts neural to load changes and offers a razor-sharp steering response. On poor roads with a wavy asphalt surface, the suspension dampens harmoniously and prevents a restless driving. Pitching and rolling movements of the body structure are significantly reduced. “The separately adjustable rebound as well as low speed and high speed compression damping give M5 drivers plenty of options to individually adapt their sedan to their personal driving preferences”, said KW Product Manager Johannes Wacker. The three-way valve technology of the Variant 4 with its 16 clicks for rebound damping forces, six clicks in low speed compression stage (seven characteristic curves) and 15 clicks in high speed compression stage (16 characteristic curves), allows the BMW M5 which is equipped for the first time with four-wheel drive, to be adjusted in driving behavior to the personal preferences of the driver. “We also rely on a similar damper technology in the original equipment of the BMW M4 GTS, where we once again worked together with BMW”, continues Johannes Wacker. „We also develop and manufacture suspension components for BMW M in factory customer sport such as the M235i Racing or other M special models.” This multi-valve technology also allows to consider the grip level of the tires when changing from road tires to sports tires. Even with maximum lowering and fast driving over bumps or large transverse joints, the wheels spring in harmoniously with the blow-off characteristics of the Variant 4 dampers. 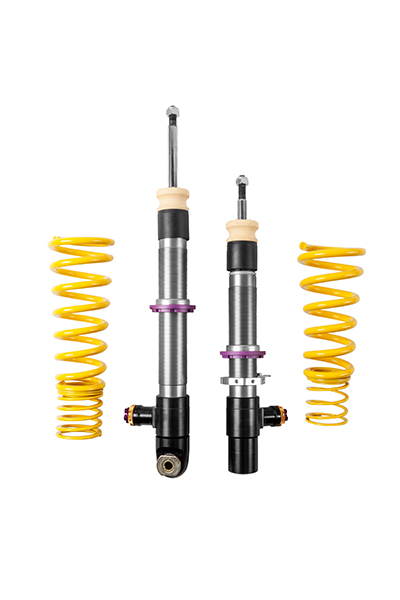 The KW coilover suspension allows the M5 to be lowered continuously on both axles from 10 to 30 millimeters.